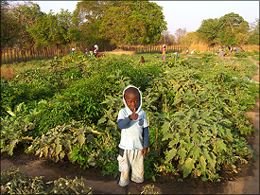 This is proving to be very productive and successful with people from other villages coming to buy produce. 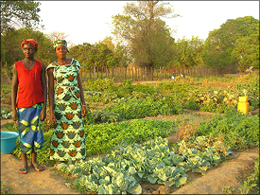 We hope to increase the size of the garden’s area to enable more women and their families to have an allotment. This has been agreed, so we hope to do this in 2008. We have now incorporated the administrative area of the school an area at the end of the computer room to enable them to share computer and printing facilities. All children in the school are now having computer studies, and from those we spoke to we get the impression that they enjoy it very much! The building has now been completed! The Charles Dickens School in Broadstairs have done a lot of fundraising for us in 2007, so along with many other contributors this ensured the completion of the building much sooner than we anticipated. We are very grateful for all the hard work and commitment by so many to help us achieve our goal. We are now fitting it out with tables, benches, storage, and all the equipment required to start very soon with sewing, soap making, and knitting crafts. The people of Si-Kunda are very excited about this project and we look forward to seeing the next stage complete. There is a veranda, an office, two large storage rooms, and an enclosed area at the back of the building which will be for the soap making, and has a toilet and washroom block. We continue to help the Soma Red Cross when we can by sending tents, computer equipment, stationery, medical dressings, and clothing. In April we painted the school inside and out with pictures of animals, village scenes, numbers, alphabet etc. 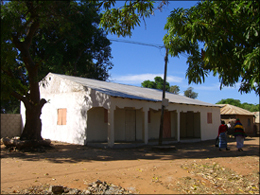 The school is now well equipped and the library is being used well. The teachers have had some training this year, and this will be continued at Toniataba School on a voluntary basis to help improve their teaching skills. Liverpool Football Club kindly provided kit for the whole team, this was arranged by Garry and Dominic who took part in the Plymouth – Banjul Rally. They also provided some footballs and various other items that have been made very good use of! 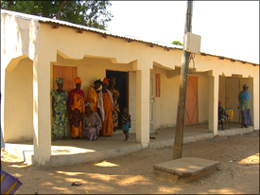 In 2007 we sent just over 2.5 tons of supplies for projects, and also the medical centres and schools that we support. 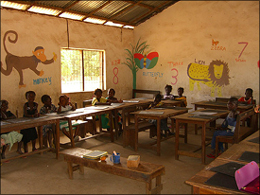 We have two extra sponsored teaching staff in Gambia, which increases our sponsored staff to eight. Also, we have 35 children who continue to be sponsored for their education. We have supplied exercise books again to Toniataba School, and in addition this year to Fonkoi Kunda Lower Basic School. We cannot put everything we do on these webpages, so if you would like further information and detail of the work we are doing please do not hesitate to contact any one of us as shown on our Contacts page.